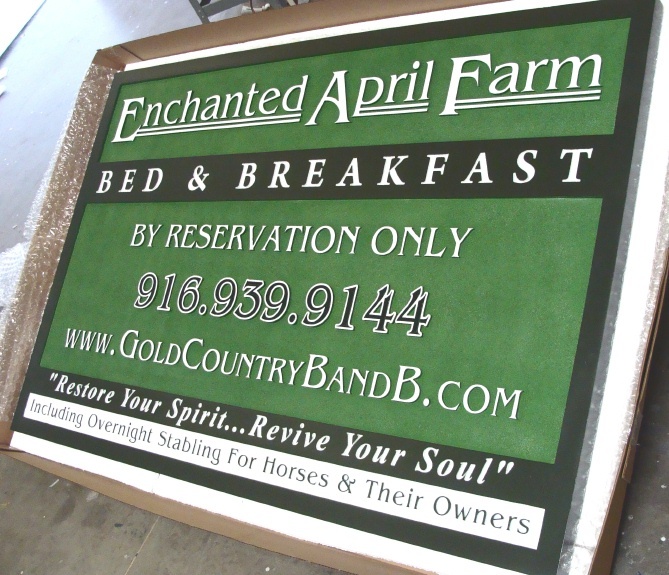 Above is shown a carved and engraved HDU sign for the "The Enchanted April Farm" inn. The attractive green and white sign above features both raised and engraved text , and a sandblasted background (sandstone texture) . The sign is hand-painted and then clear-coated, This sign can be mounted on an outside wall or placed between two posts. For design options, prices, and delivery schedules, please call 951-698-8484 or email us at info@artsignworks.com, and our helpful and knowledgeable customer service representatives will respond promptly. Please click on one of the numbered gray boxes on the lower left margin of this page to see other Photo Galleries, or use the navigation dark gray tabs at the top, or the gray boxes on the upper left margin to see other information. You can search for a specific sign type on this website by typing in key words in the Google Search bar at the top of this page. You can return to Gallery 29 (hotel, resort, inn and B&B signs) page by clicking "Return to List" below right.